First launched in the mid 1930s, reference 2508 was Rolex's very first wristwatch to feature two chronograph registers, as well as two buttons to operate the mechanism. The reference can generally be divided into two series. While those from the first generation feature 'olive' pushers and a larger case size, second generation examples feature flat pushers and a relatively smaller case diameter. At the time of production, the relatively large case size was incredibly unusual for the period. Unsurprisingly, the model exudes a modern appearance today. 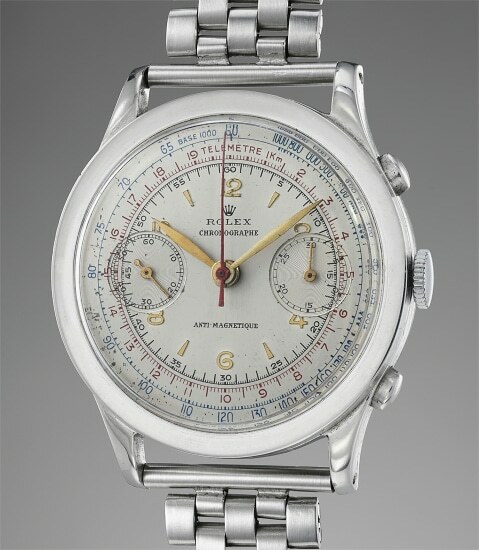 Fitted with elegant "olive" pushers, this first generation example is preserved in excellent condition with crisp reference and case numbers on the caseback. The case is preserved in particularly excellent condition with sharp finishes and robust proportions. It is furthermore fitted with a 1950s Rolex brick-link bracelet.